The Eucalyptus Management Console can be deployed in a variety of ways, but we’d obviously like it to be scalable, highly available and responsive. Last summer, I wrote up the details of deploying the console with Auto Scaling coupled with Elastic Load Balancing. The Cloud Formations service ties this all together by putting all of the details of how to use these services together in one template. This post will describe an example of how you can do this which works well on Eucalyptus (and AWS) and may guide you with your own application as well. Let’s tackle a fairly simple deployment for the first round. For now, we’ll setup a LaunchConfig, AS group and ELB. We’ll also set up a security group for the AS group and allow access only to the ELB. Finally, we’ll set up a self signed SSL cert for the console. In another post, we’ll add memcached and and a cloudwatch alarm to automate scaling the console. Instead of pasting pieces of the template here, why not open the template in another window. Under the “Resources” section, you’ll find the items I listed above. Notice “ConsoleLaunchConfig” pulls some values from the “Parameters” section such as KeyName, ImageId and InstanceType. Also uses is the “CloudIP”, but that gets included in a cloud-init script that is passed to UserData. Also, notice the SecurityGroups section that refers to the “ConsoleSecurityGroup” defined further down. Right above that is the “ConsoleScalingGroup” which pulls in the launch config we just defined. Next “ConsoleELB” defines an ELB that listens for https traffic on 443 and talks to port 8888 on autoscaled instances. It defines a simple health check to verify the console process is running. The “ConsoleSecurityGroup” uses attributes of the ELB to allow access only to the ELB security group on port 8888. We also allow for ssh ingress from a provided CIDR via “SSHLocation”. To automate deploying the console using this Cloud Formations template, I wrote a shell script to pass the required values and create the stack. At the top of the script, there are 3 values you will need to set based on your cloud. CLOUD_IP is the address for your cloud front end. SSH_KEY is the name of the Keypair you’d like to use for ssh access into the instances (if any). IMAGE_ID must be the emi-id of a CentOS 6.6 image on your cloud. There are other values you may wish to change just below that. Those are used to create a self-signed SSL certificate. This cert will be installed in your account and it’s name passed into “euform-create-stack” command along with several other values we’ve already discussed. If you’ve run this script successfully, you can check the status of the stack by running “euform-describe-stacks console-stack”. Once completed, the output section will show the URL to use to connect to your new ELB front-end. To adjust the number of instances in the scaling group, you can use euscale-update-auto-scaling-group –desired-capacity=N. Since the template defines max count as 3, you would need to make other adjustments for running a larger deployment. Check back again to see how to configure a shared memcached instance and auto-scale the console. At Eucalyptus, we’ve leveraged the existing compute infrastructure to deploy some new services. For example, ELB and our imaging service user workers that run as instances. This is useful because the cloud administrator won’t need to configure new machines to handle these tasks. The workers can be dynamically provisioned on top of existing infrastructure and that’s what cloud is all about! 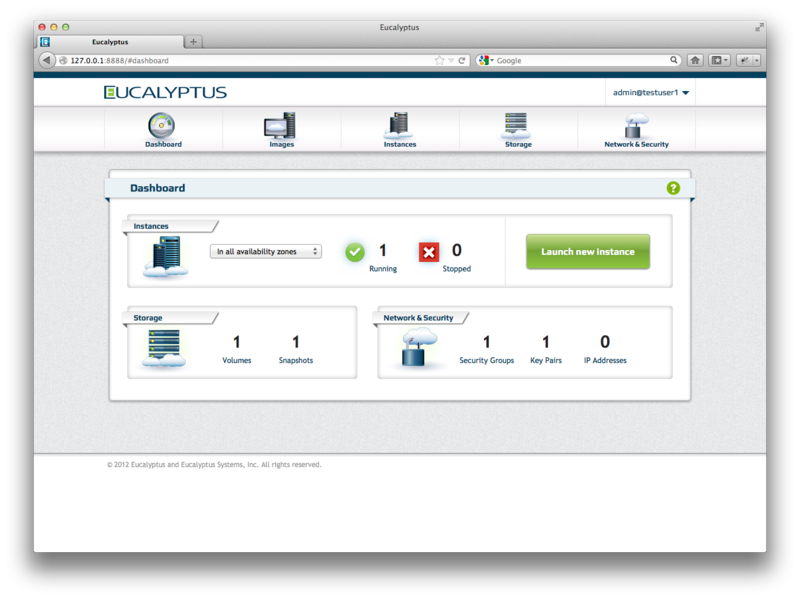 The management console can be deployed on top of Eucalyptus as well. In fact, using ELB and Autoscaling, we can provide a single service endpoint for users and runs a scalable back-end. Since Eucalyptus provides RHEL/CentOS packages, I started by installing a CentOS 6 image from http://emis.eucalyptus.com/. This image included cloud-init so I can very easily provision the console on an instance with user data. Here is the cloud-init script you would supply in user data. The one value that needs to be adjusted for your install is the cloud IP address (10.111.5.35). The cloud I used had 2 clusters shown above. I also set up port 80 on the elb to talk to port 8888 on the instances. We could also set up port 443 and SSL termination instead. Now, run eulb-describe-lbs console-lb –show-long and you’ll notice the owner-alias and group-name values. That’s the internal security group you’ll need to authorize port 8888 ingress for. What that does is indicate these instances only give access to ELB traffic on the port the console runs on. Run the euca-authorize command using the owner-alias and group-name (i.e. euca-authorize -P tcp -p 8888 -o euca-internal-276586128672-console-elb -u 641936683417 console-as-group). The launch config needs the CentOS 6 EMI ID. I also used an m1.medium since it uses more memory, but still a single CPU. You can certainly dedicate more resources to single instances as you see fit. Specifying an ssh key is optional unless things have gone pear-shaped. The autoscaling group ties things together. After the last command runs, you should get 2 instances pending. Once those are up, eulb-describe-instance-health console-lb will show you the state of the instances from an end-user perspective. An “InService” instance can handle requests going through the ELB whereas “OutOfService” instances may still be installing/configuring per cloud-init. The grace period determines how long the scaling group waits for those to be ready. There is a lot more we could do with cloud watch data and autoscaling. For now, this setup will let you manually adjust the number of instances you dedicate to the console scaling group. You can point your browser to the ELB DNS name and see the console login screen! Now you can use the console with https! To see details of the ELB, run “eulb-describe-lbs console-elb –show-long”. You might want to remove the port 80 listener. To do that, type “eulb-delete-lb-listeners -l 80 console-lb”. As developers, we sometimes run into problems that are somewhat… challenging. That’s part of the fun of writing code though. I like trying to find clever ways to solve a problem. This was the case when trying to integrate memcached into the Eucalyptus Management Console. Version 4.0 of the console uses Gunicorn which utilizes separate worker processes to handle requests. To implement any kind of effective caching, we’d need a shared cache. Memcached is a pretty obvious choice. Since we were using pyramid, beaker seems like an obvious option. Beaker does have support for memcached, but as the author points out, dogpile.cache is a much better choice as a cache interface library. Dogpile.cache has backends for memcached, redis and others which allow for some more interesting choices architecturally. Our application uses boto to talk to both Eucalyptus and AWS. To start with, we wanted to cache image lists since they don’t change often and they can be fairly large. Dogpile.cache has regions you configure (generally for different expiration times). We set up short_term, long_term and others for our application. While working on a prototype for this, I ran into 2 main issues which I’ll cover in detail: pickle doesn’t handle all boto object graphs and invalidation of cache data. We have an array of boto.ec2.image.Image objects that need to be cached. The memcached backend for dogpile.cache can use one of a few python interfaces to memcached. I chose to use python-memcached. It pickles the data before sending it to the memcached server. For those who don’t know, pickling is a way to encode python data and can be used to marshall and unmarshall object graphs. Anyway, some boto objects don’t marshall very well. I ran into this about 2 years ago when working on the first version of the console that used the JSONEncoder to send json versions of the boto objects to the browser as AJAX responses. I had to write my own JSONEncoder to handle the objects which didn’t marshall properly. The JSONEncoder supports passing your own implementation which handles object conversion, so that made life a little easier. The Pickler also supports this, but the implementation is buried down in the python-memcached package and there is no way to pass your own pickler down from the dogpile.cache layer. (I feel a pull request coming..) What I chose to do instead was to iterate over the image list and make adjustments to the objects graphs prior to storing in the cache. Certainly, this isn’t ideal, but it works for now. In doing this, I was able to delete some values out of the object graph which I don’t care about which saves time and space in the cache mechanism. I also found that (in this case) the boto.ec2.blockdevicemapping.BlockDeviceType object contained a circular reference which was causing the pickler to barf. I trimmed this out during my iteration and pickling worked fine! I found it very helpful to see what object was causing the problem and could insert a breakpoint to inspect that object when the problem occurs. In the memcache.py file of python-memcached, I had to change an import so that cpickler wasn’t used. That’s a native pickler which is much faster, but doesn’t allow me to extend it in this way. This is clearly only a debugging tool and the standard package code should be used in production. Each item stored in a cache region has a key generated. When using the @cache_on_arguments decorator, the cache key is created based on the string form of the arguments passed to the cache function. The decorator takes a namespace argument, so I was able to specify an additional key component so that any image values being cached all included “image” in the cache key. By default the key is also run through sha1 to create a digest to get consistent length (and obfuscated) cache keys. This works well and would have been all I had to do except that I couldn’t simply rely on the configured expiration of the cache region. There are cases where we needed to invalidate the set of data in the cache due to changes initiated within the application. In that case, our user would expect to see the new data immediately. The namespace and arg list are passed to the key generator as you can see. This is merely a helper function. To invalidate the image cache, I needed to call the above function with the proper arguments. These are the same arguments passed in to the cache function (which uses the decorator). The work on shared caching is currently in a branch, but will likely be merged into develop over the next month or so. I realize that 650K is not that far from 1MB, so perhaps splitting up the data will be needed at some point. The failure mode is simply a performance one, not so fatal. run memcached from a shell with -vv option. You’ll get useful output about get, set, send and delete operations. If you haven’t seen the new console yet, it adds support for IAM Users and Groups. This means you can manage users, groups and policies for the account, all from the console. This branch adds support for IAM Roles. Along side users and groups, you’ll be able to create, view and delete roles. To use roles, you assign them to instances or launch configurations (for AutoScaling). This allows you to assign special privileges to instances. I’ve added the ability to assign a role in both the new instance wizard and launch configuration wizard. The required IAM Instance Profile is handled for you by the console. Here are some screen shots to show you a few of the changes. I want to talk about something new we’re working on at Eucalyptus, but first let me start with a little background. Quite simply, it is a hassle to get an image installed. The current process for Eucalyptus (as we document it) is to download a tarball, untar it, bundle/upload/register the kernel/ramdisk and image itself. That’s about 11 steps. We thought there must be a simpler way to do this. What we came up with is eustore. In the spirit of euca2ools (euca- and euare- commands), eustore commands give you access to a Eucalyptus image store. That’s store, as in storehouse, not a shop. We have some updated “base” images available on our servers. We have a catalog file that contains metadata about those images. The eustore tools simply give you access to those, and let you issue a single command to download an install an image on your local cloud (or any Eucalyptus cloud you have access to). The code has been checked in with the euca2ools. To install and use the commands, you’ll need to build from source and tweak the setup.py. Let’s go over that now. This command installs the image named into the myimages bucket on the cloud you are setup to talk to. As with all euca2ools, you’d first source the eucarc file that came with your cloud credentials. I should point out something about uploading kernel and ramdisk to your cloud. Only the admin can install these. If you have admin credentials, the above command will work fine. If you don’t and want to install an image anyway, you would use the –kernel and –ramdisk options to refer to a kernel id and ramdisk id already installed on the cloud. That way, this command will ignore the kernel and ramdisk bundled with the image and refer to the previously uploaded ones. 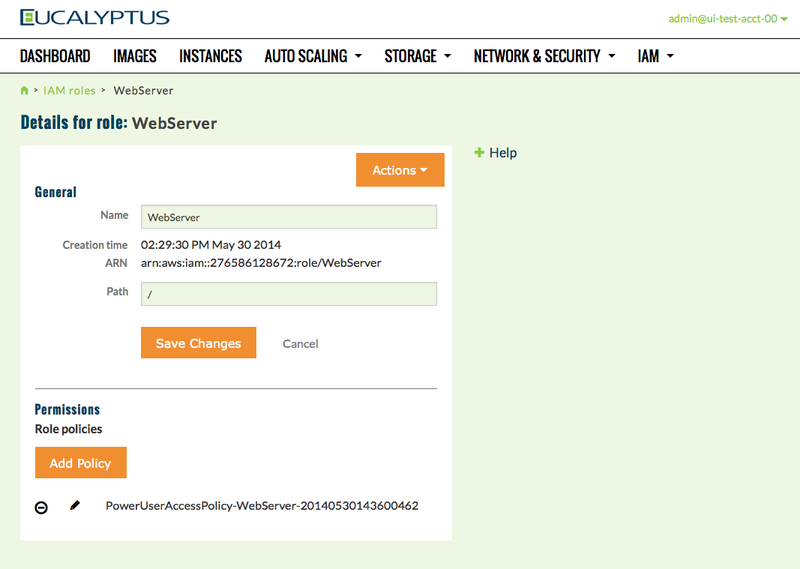 There have been different instructions for using an image from Amazon’s EC2 on a local Eucalyptus cluster. This seems to be what worked best for me. 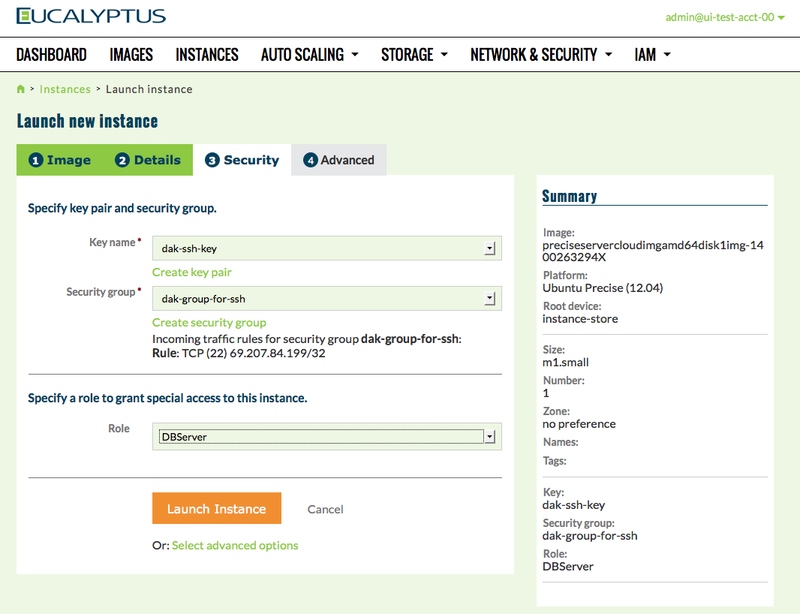 The basic steps are, launch an instance of the AMI, run euca-bundle-vol with your Eucalyptus credentials, upload bundle, register. While it would be possible to use the download-bundle/un-bundle method detailed in this post, that only works with images that your account created. The use case I’m addressing here is to get starting images for building some custom images within your private cloud. Another use case is when duplicating custom images from private to public cloud for purposes of cloud-bursting. That’ll be covered in another post. To bundle/upload the image, you’ll need the euca2ools. There are some instructions here that help. This Maverick image already has them installed. If the image has a default kernel specified (as this Maverick one does), that aki id won’t work on eucalyptus. For the ECC, looking at the list of images shows that many of them specify the eki-6CBD12F2 kernel, so I will also use that when overriding the EC2 kernel. If you run your own Eucalyptus installation, it is easy to get the default kernel id via the management interface on the “Configuration” tab. Take note of the ramdisk id also, since that goes hand-in-hand with the kernel. In the case of a private Eucalyptus installation, network restrictions probably won't allow the EC2 instance to upload to Eucalyptus directly. One way to do that is downloading a gzipped image to your local machine, run euca-bundle-image prior to upload. That is time consuming and since I'm working with ECC here, all of the operations can be run on the EC2 instance. At this point, you should be all set to launch the image. Footnote: I've tested this with a Maverick S3 backed AMI and a Lucid EBS backed AMI.